I love love love this ring. It is substantial, masculine and ALWAYS gets comments when I wear it. It is a substantial ring and if you have small,hands or fingers that will be an issue. Want s stamens ring? This is it. This handmade creation is offered in partnership with NOVICA, in association with National Geographic. 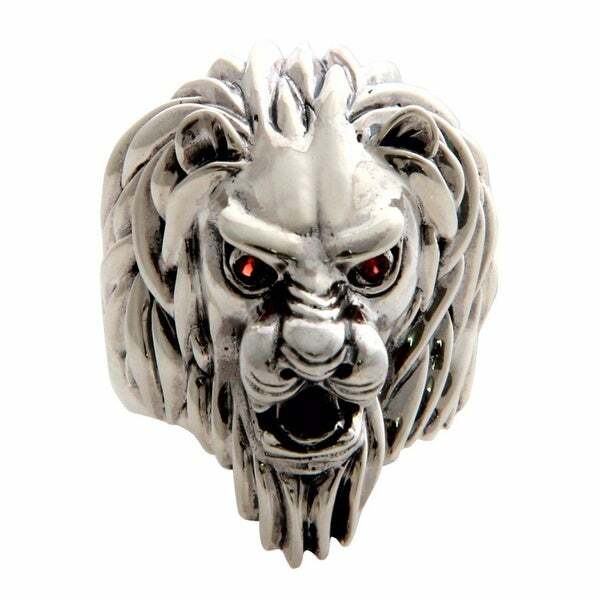 Henry Anthony Sanny captures the regal aura of power the lion holds in the admirable craftsmanship of this men's ring. Sanny handmade the sterling silver ring, his expertise evident in the detailed depiction of this extraordinary bird. Sanny selects garnet, gem of love, for the lion's eyes. Henry's jewelry collections for men are influenced by his Indonesian surroundings, as well as by his admiration of Japanese artistry. Born in Jakarta, Henry's adventurous spirit found reflection in the wide variety of jobs he's had: from waiting tables in Perth, Tokyo, Amsterdam and Rotterdam, to designing chairs for a furniture company. His artistic spirit found reflection in jewelry design, and Bali became the perfect setting. "I used to live in Jakarta, but it was difficult to find jewelry that was specifically designed for men. So I decided to leave the hustle and bustle of Jakarta and move to Bali in 2002, where I could pursue my dreams and create my own collections, recalls Henry. Designing jewelry for men has become an intrinsic part of my lifestyle, Henry tells us. In my designs I'm often funky and chunky and I like to mix different materials such as sterling silver, leather and bone. My goals in life are to raise my three kids, be a good partner for the artisans that work with me, and keep focused in designing men's silver jewelry, says Henry with a smile. Dimensions 1.4 In. X 1.0 In. X 0.7 In. This is a very detailed, beautiful, heavy and large men's ring from Henry Anthony Sanny. The silver - onyx ring is sold in partnership with NOVICA, which makes it more desirable as a product because we as buyers support artists in developing countries. The ring, as pointed out by another review, is a conversation piece! It is great as a birthday or anniversary present for a man who is under the fifth sign of the Zodiac - Leo (July 23 - August 22 ). The ring is great as a recognition present. It is really big and powerful! Enjoy it! Received this beauty in the mail after quite a bit of time.Well worth the wait though i might add.Its pretty heavy and very durable.I wear it all the time during concrete work.Lifting heavy objects and the ring hasn't bent once unlike my other rings.I believe its been oxidized to give it a certain look.So if your looking for that super shiny silver look this isn't the ring for you.Overall quality of detail is superb. No regrets on this purchase - inspite of the size of the ring ( and it's as bold in person as you picture it from a 2d web image) it seems like the fit is generous. I bought a size ten, which sometimes feel too small for a middle finger and it's perfect. Fits great. Big and bold. Nice sculpture work! Awesome ring, a lot of people have asked about it and have liked it. I am a Leo. Used to have a gold one but hard times came. Love the looks of this one. "Still waiting for u to research this ring. I think if you pick one up and look at it you will have the answers to my questions. I want to buy this during this lifetime please. If the eyes are red they are garnet. If black they are onyx. Then all you have to do is measure the ring. :) Try it." Hello Andrew W., the description provided is correct, the eyes are a garnet stone in which we will update as soon as possible and the dimensions are approximately; Ring front: 25 mm wide x 36 mm long x 18 mm high, Band width: 5 mm, all ring sizes are different which you can select in the options box. Have a good day! "Hi. I have several questions regarding lions head ring. Are the measurments right? The mm gauges you list make this ring HUGE! Finally. In description one says garnet eyes and across the other description says onyx. Which one is it please. I want to buy this piece but the info is saying to many different things. Thank you. Andy"
Hello Andrew W., the dimensions of the ring are correct, the gemstone is garnet, not onyx, we will work on updating that as soon as possible. Have a great day! "I need a 13 or 14 in this ring. Will you ever have one in that size?" Item sizes are stocked as they come available. However, we cannot guarantee when or if a item specific item size will ever be stocked.